All government and private schools were closed in Kinnaur, Kullu and Kangra. Fresh snowfall in Keylon in Lahaul-Spiti district, early on Sunday. The Himachal Pradesh government has ordered closure of all schools in three districts on Monday after rain and snowfall lashed many areas of the state, officials said on Sunday. The Met Office has forecast heavy rains and snowfall in the upper hills till Monday. All government and private schools will remain closed in Kinnaur, Kullu and Kangra districts, officials said. 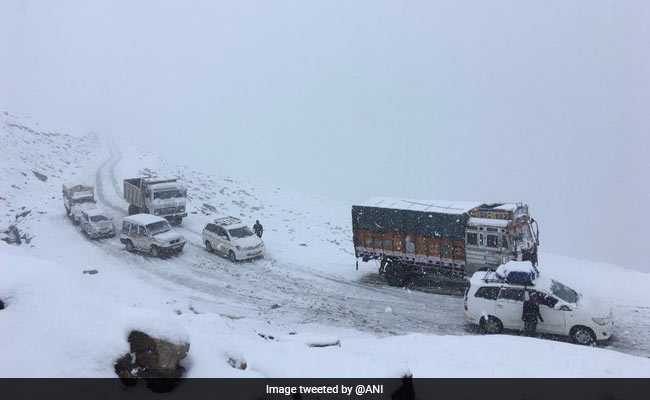 At least 20 stranded people have been rescued from Rohtang Pass in Himachal Pradesh on Sunday after heavy snowfall, a Border Roads Organisation (BRO) official said. After getting information, a General Reserve Engineer Force (GREF) truck was sent and they were brought to Manali safely with the help of Col A K Awasthi and Kullu Deputy Commissioner Yunus. Rohtang Pass witnessed about four feet of fresh snowfall on Sunday. The people should take utmost care while coming out of their homes in the area, the officer added.